Ride Details: 103 miles on Highway 1, Highway 41, Kiler Canyon, and Highway 46, with glorious stops in Paso Robles and Cayucos. Strava file. "Uh, Liam, should we stop and get water there?" I stammered. 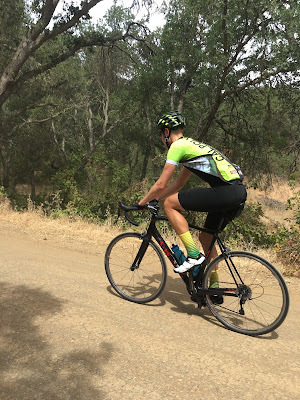 On Saturday, June 4, towards the end of my second year at Cal Poly, San Luis Obispo, 103 glorious road and dirt miles occurred north of San Luis Obispo. The instigator... Liam Dunn, a first-year student at Cal Poly, who reigns from ColoRADo (I couldn't help myself). 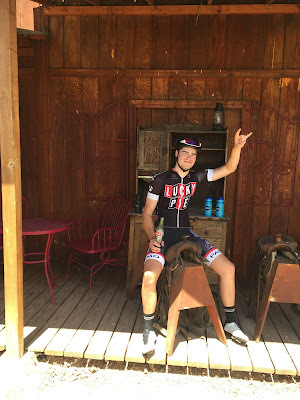 According to Liam, "bucket list rides before heading home for summer" is how he explained our adventure, which began with an additional four friends. Ladies and gentlemen, Liam Dunn. We rolled early, at 8 a.m., which isn't bad for a group of collegiate cyclists, especially with finals looming. North, its where we headed. Highway 1 struck early, before heading east on Highway 41 to reach Atascadero. During the Highway 41 climb, local legend Blake Anton rode the front at 300 watts... to prevent attacks. Well, it worked. Our group of six rolled into Atascadero, where we eventually split. Liam and I proceeded north, towards Paso Robles, while the others headed home to San Luis Obispo. Originally, the plan was for us to tag Peachy Canyon, a steady climb out of Paso Robles. 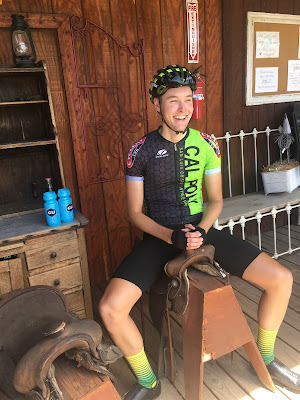 Instead, we rolled up Kiler Canyon, which flows before turning to a substantial dirt climb that intersects Peachy Canyon. Kiler Canyon dirt. Credit: Liam Dunn. After fulfilling our daily dirt climb, Highway 46 allowed us to head east. Highway 46 is where our day became truly memorable. It was dry and hot, especially for early June, as the temperature soared into the 90s. I, being a camel, was guzzling water and continuously facing the threat of dry bottles. Moving along Highway 46, our next planned stop was in Cayucos, until we noticed a dirt driveway, which we proudly rolled past. It was then that I stammered, "Uh, Liam, should we stop and get water there?" 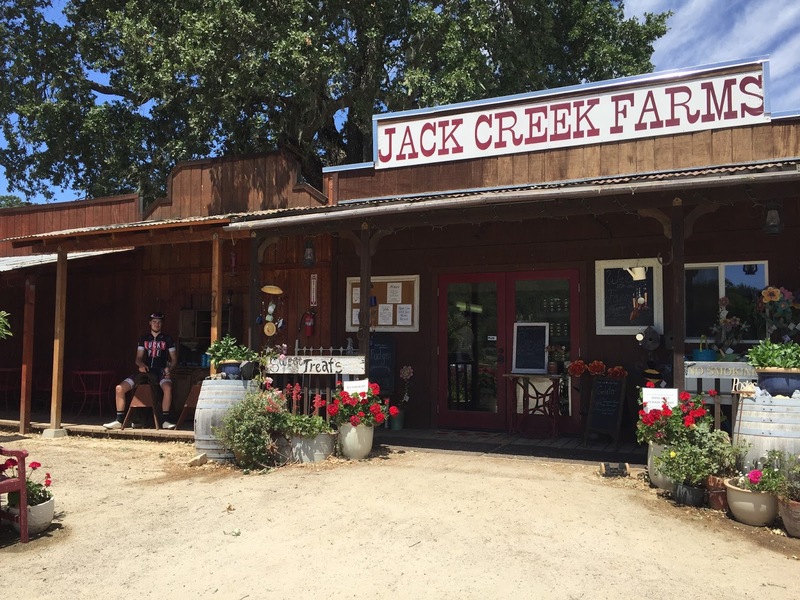 We decided it would be wise to fill bottles and regroup at Jack Creek Farms, a sweet store just west of Paso Robles. Three waters, one Coca-Cola, and an $0.82 peach, which we only had $0.81 for. Praise penny dishes. That sounds like a pretty typical cycling rest stop. Saddle up. Credit: Liam Dunn. After mounting our steeds, we rolled towards Highway 1, which took us to Cayucos. Along Highway 1, which was engulfed in a complete fog bank, the temperature lowered to 60ish degrees. However, Liam and I trudged forward with jerseys unzipped and grins on our faces. Naturally, we began giving each other slight pushes to increase the pace. In Cayucos, multiple waters, Coca-Cola, salt and vinegar chips, and a Snickers bar left us satisfied. Another typical cycling rest stop. Then, we rolled home to San Luis Obispo, while continuing with light conversation and plenty of memories. Another day, another adventure, except this one won't be fleeting my memory banks any time soon. Until next time, thank you for contemplating my interpretation of Thereabouts, which includes adventure, rest stop characters, and plenty of memories.